Abstract: Policy makers are uncertain whether there are cost-effective public health investments to alleviate the consequences of global warming among the world’s vulnerable populations. We examine the impact of extreme heat during pregnancy on infant mortality and check if public interventions can serve as effective adaptation strategies. 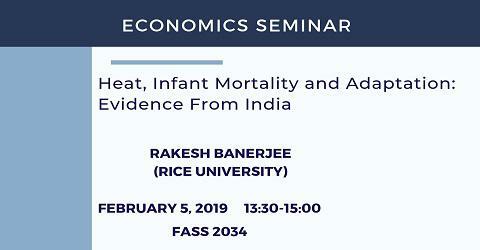 We show that 2 children die as infants out of 1000 births in India for high temperature during pregnancy, tentatively due to reduced agricultural yields, wages, and greater disease prevalence like diarrhea. The heat infant mortality relationship holds in rural India only. Using phased introduction of an employment guarantee program and partial introduction of a community health care worker program for identification, we find that only the health program is effective in modifying the temperature-infant mortality relationship in rural India.